Published: July 6, 2017 at 11:10 a.m. Updated: July 11, 2017 at 02:05 p.m.
Editor's note: NFL.com analyst and former NFL scout Daniel Jeremiah takes a "first look" at college football's top players for 2017. This is the ninth in a series of scouting reports that will run throughout the offseason. 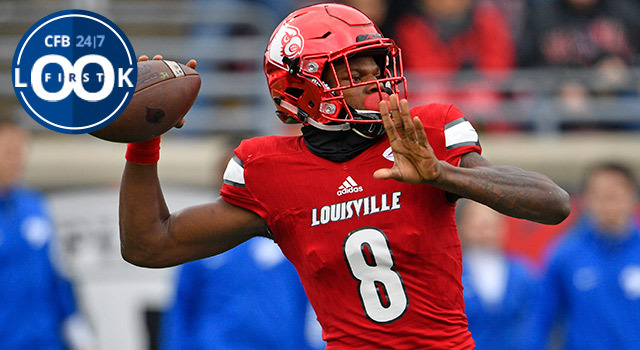 Lamar Jackson took home the Heisman Trophy last year, but he's not receiving as much buzz as some of the other top QB prospects heading into the 2017 season. He is college football's most electric playmaker and Louisville is capable of knocking off any team in the country when he's on his game. I recently had a chance to study three of his games from last season. Here's my scouting report. He has tremendous upside as a passer but his ability to make plays with his legs is what makes him special. He has Mike Vick-type explosiveness when he takes off on designed QB runs or scrambles. He gets up to top speed immediately and destroys pursuit angles from opposing safeties. He isn't quite as shifty as Vick, but he is just as fast in a straight line. Where he needs to improve: Jackson has a ways to go to develop into a consistently accurate passer. He has a bad habit of locking out his front leg, screwing himself into the ground and falling off throws. This dramatically affects his ball placement and touch. He flashes the ability to work to Nos. 2-3 in his progression, but usually if No. 1 isn't there, he looks to run. In his defense, the pass protection at Louisville was terrible at times (see Houston game). The other major concern about Jackson is his thin frame. He is very wiry and he'll need to add some bulk to withstand a 16-game schedule at the next level. The same things were said about Deshaun Watson early in his college career. He packed on plenty of bulk before leaving Clemson and hopefully Jackson will do the same. Biggest takeaway: I don't use the Mike Vick comparison lightly. Vick is the most explosive quarterback to ever play the position. Jackson has that type of dynamic speed. However, Vick was a more polished passer and Jackson has some mechanical improvements that need to be made before he'll be capable of matching Vick's professional success. If Jackson can clean some of these issues up, watch out! I can't wait to see him play ... Clemson on Sept. 16. Jackson put on an impressive display against the Tigers last fall, but Louisville came up a little short against the eventual national champions. This time, Jackson gets to play the Tigers at home. Last year, a highly rated Florida State squad came to Louisville and got thrashed. That was probably the moment that won Jackson the Heisman Trophy. If he leads his team to a win over Clemson this year, his campaign for a second consecutive Heisman would receive a huge jolt.